Car inspired by Marvin's build. Plasma piston engine, 2 gears. Using only 1 cap per cannon felt right to me, probably because of ACL rules, so it is not surprising that engine is weak for its size. I like the idea, maybe I'll build another piston engine soon. Currently I have a one cylinder engine that stops after several revolutions. Impressive. Getting things properly synchronized is usually a problem. To avoid problems with code speed you can increase rotor's lift - put more fins on each blade or make blades longer so that fins have more linear speed at the same angular speed. Опять началась разработка, перешли на Unreal Engine, обещают в апреле что-нибудь показать. Rawbots should keep visual programming system, it is really good for simple bots and seems to be more accessible to players that have no "real" programming experience. So default programming mode should be more casual VP. I like the idea of script executor VP tile with multiple inputs, it can easily fit existing VP model. Somewhat related but simpler thing to do is VP tile for text math expression. Current math implementation makes relatively simple calculations take several screens. Most people are used to see math as text like "a + sin(b) - 2 * c^2" not web of VP tiles. Such part would decrease code size of my bots by half or even more. I think most of the people building entries have a couple of basic platforms and turrets that they use as a template to build a particular bots specialised parts around. It still takes much time. Probably it is worse for me, since I usually try to use new weapon and tactic I never used in ACL. Old rules banned jets/propellers completely. Not only for downforce, but also steering, acceleration, whatever else. I think this ban was good and we should keep it. Why constant mass? To prevent bots from increasing mass before ramming others? Using mass to balance bot on high speed turns didn't really help me, if I remember correctly, side continuums on my race bot were originally added for this. Maybe we should move this discussion to another thread? I have blueprint for my race challenge entry. It was built with XFM installed. A race video I uploaded on old forums is still on youtube. Screenshots & Videos / Re: Cupid's Automated Rocket Bots! Wow, these rockets fly much more precisely than I expected. With that much speed, do they work correctly with heavy bots at low FPS? Since rockets are limited, turret needs a hook to prevent it from trying to shoot through walls. Have you thought about relaxing the distance/proximity requirements for detonating the grenade? It looked like there were a few cases where the grenade passed close enough to do major damage without being detonated. It could be effective to deploy all the lances in a fan pattern when space allows to give it more chances to get one of them into range. I increased detonation distance for fight with bigger bots. The problem is that Lancer usually damages itself, and with increased distance to do it more often (detonation of almost deployed grenades), so I try to keep distance as low as possible to avoid damage to front wheels (it happened a few times). Also if target part is too close to grenade, Lancer looses target for a short time because there is some space around grenade that is not covered by cameras, these situations can be mistaken for too low detonation distance. Deploying multiple lances should work great given enough space and some elevation control. Perhaps now would be a good time to add some new variations on the basic ACL to keep things interesting. Sumo - there are infinite forces, infinite masses and partially broken physics. It will need rules to control this. Air - would be nice. I am not sure if fights in a spherical arena would be easy to watch. My zero gravity big bot construction map (a closed box) is quite unpleasant place, camera is bumping into walls and has weird direction controls. Death race - it would be nice to get some race challenge running. If I remember correctly, there were only one or two entries in race challenge on old forums. May need separate divisions "flying" and "no jets, no propellers, no mass drives". Swarms - we still have not seen much teamwork. Ant seems to only have friendly fire protection in targeting system. Same for Nest's missiles. Unguided grenade weapons - Catapults. Rockets. Spin a grenade, roll it forward, wait, detonate, laser-ram the survivors. Grabbing devices on laser bots - stick some thin parts into opponents armor. Maybe try to lift his front to attack bottom. Attach a grabber with jet and run jet at full thrust to get opponent out of the map? Maybe not the most practical thing to do but would be fun to look at. Non-plasma hovers - why is plasma the only weapon ever used in the air? 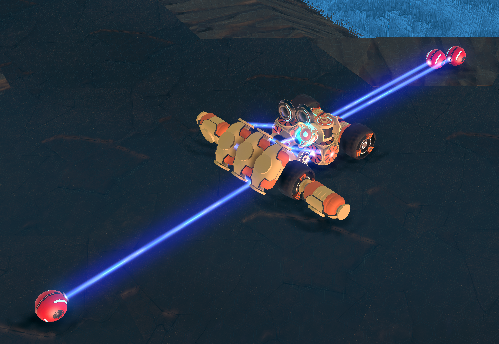 Most bots are vulnerable to direct top-down laser attack. Automated bombing is possible in controlled environment, somebody tried it on old forum. I think the main limit of ACL is that automated combat bots are hard to build and require much time. I tried it on heavier plasma shooters. It is still effective, but you can see it take serious damage. The main problem seems to be lack of rear camera, but it can't have more parts and stay lightweight. It is quite bad in tight spaces or just fighting near the not smooth wall, but I don't think adding a vulnerable elbow in front of the bot will make its life easier. If I ever decide to make it middle or heavy I would add rear camera, turret and grenade elevation, and make it less vulnerable to top-down fire (HailStorm can fire over its armor). Not a conventional turret but something like what was on Lancer's early prototype. Lance arcs would go through armor on bot's body. Uses three grenade-lances to charge the opponent. After a few fights I did it looks quite effective for a lightweight if it manages to get into fight. Some fights ended with it being destroyed from behind (no rear looking camera, no armor on the back) or navigation failure. Here is a script that does what you described. Needs either linux shell or cygwin. Says that Nest is 171 part.